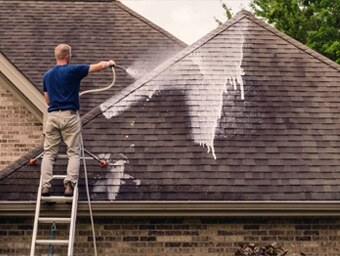 We offer a competitively priced roof cleaning service for commercial, industrial and domestic customers throughout Nottinghamshire and the rest of the East Midlands. The build up of dirt, moss and algae can have a damaging effect towards a property. Gutters can become blocked, leading to significant water damage if left unattended. In addition to this, sky lights can become covered, prohibiting daylight to enter a building. This can also prove a further risk to health and safety, especially within a commercial or industrial environment. We cover all types of roofing including surfaces containing asbestos. Simply call us on 01159 626 699 to discuss your requirements. Aquablast Roof cleaning is not only important aesthetically, it is also crucial for minimising the risk of damage to your property. We use a steam cleaning system at 120 degrees With not much pressure so does not damage roof or tiles.